Claire McCaskill isn’t fooling anyone. With her campaign right around the corner, McCaskill is beginning the familiar process of trying to position herself as a moderate, despite that being far from the truth. 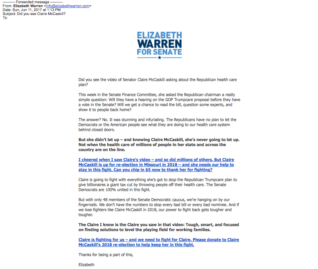 Just look who blasted out a fundraising email yesterday touting her re-election: Elizabeth Warren! However, Missourians have already made it clear that they reject Elizabeth Warren’s out-of-touch approach. Last October, she travelled to Kansas City to campaign with Jason Kander, only to see him lose in the fall. Kander’s loss was compounded by President Trump defeating firm McCaskill ally Hillary Clinton by 19 points in the state. Senator McCaskill clearly didn’t get the message from Show-Me State voters. Instead of working with President Trump to reform Washington, she is now joined at the hip with the leader of the so-called “Resistance,” clearly putting the interests of the far-left before the constituents she is supposed to represent.